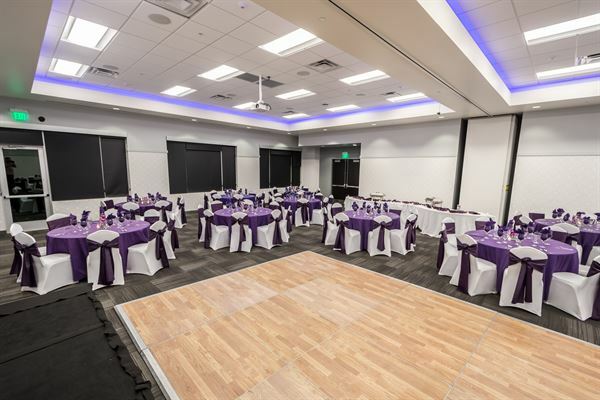 The Forum is a one-of-a-kind 21,000 sq ft facility in Chandler.It provides an amazing event space available to everyone. The Forum has two incredible places available for events – a banquet room and a two- tier patio with fire tables, a fire place, and full bar. The Arizona Golf Resort is a 130-room property offering breathtaking outdoor wedding ceremony locations with golf course views and beautiful water features. With over 20,000 square feet of function space including two newly renovated ballrooms and a relaxed garden pavilion we can accommodate functions from 10-500! We pride ourselves on creating weddings and events that satisfy both taste and budget, by designing your menu and reception with you in mind! We take all the stress out of planning your big day. Our experienced, professional catering team works with you on your planning needs as well as assisting with your wedding rehearsal and ensuring your reception is flawless. The Arizona Golf Resort offers everything to make your Wedding your fairytale. Red Mountain Ranch Country Club is a premier venue located in scenic Northeast Mesa. We offer 2 intimate outdoor ceremony sites, including the scenic 18th Fairway and classic Courtyard Rotunda. Our Overlook dining room provides a uniquely "Southwest" ambiance boasting mountain views, vibrant sunsets and panoramic city lights, unmatched anywhere in the Valley! Our professional, friendly staff will put your mind at ease and provide the picture-perfect backdrop for the wedding of your dreams! Wekopa Resort and Conference Center is a truly unique location where Native American tradition, contemporary architecture, championship golf courses, mountain views and desert activities come together in one place. Dazzle your guests in the pristine Sonoran Desert surrounded by views of 4 Peaks Mountain or step indoors to our 18,000-square-foot ballroom. Our Catering Team will work with you from start to finish to ensure your vision becomes a reality. Located on the eastern edge of Scottsdale, the Wekopa Resort offers some of the most unforgettable views in the valley and is an ideal location for all of your celebration needs.